How much do you pay for a litre of milk? Ever wondered how supermarkets can sell it so cheaply? Bear with me this post isn’t a home economics assignment. Rather the concentration of power supermarkets hold over the dairy industry has parallels with what news we consume. 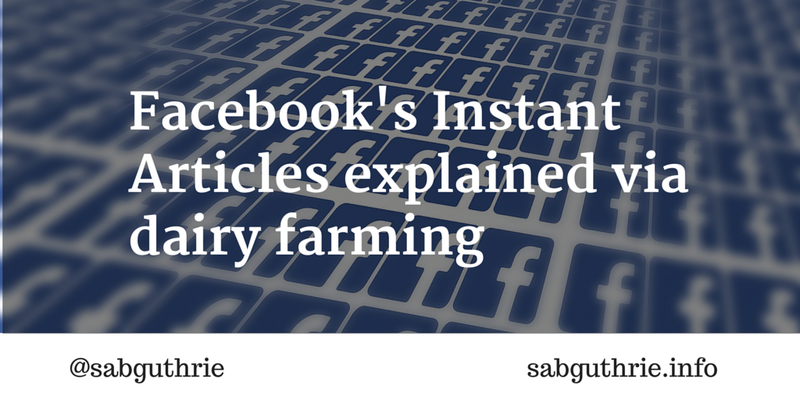 Facebook’s grip on distributing news is tightening with the arrival of Instant Articles which lets news outlets publish stories directly to its platform. And where their content is housed directly on the Facebook servers rather than the news outlets’ own. So far nine mastheads have signed up to Instant Articles including New York Times, Guardian, BBC, Bild, Spiegel and Buzzfeed. Buzzfeed has gone all out in embracing the new publishing mechanism committing to put all content on Facebook. Perhaps not surprising given that Facebook already drives two-thirds of Buzzfeed’s traffic. For Facebook the initiative seems to be working. Its reach is growing so quickly it now rivals Google as the most popular gateway to mainstream sites. High fives all round for Instant Articles game changer? This shift to direct publishing of news outlet content is a game changer. The mastheads get access to bigger audiences. A lifeline in today’s ever more fragmented media landscape. They also get to keep a large slug – sometimes all – of the advertising revenue. At first glance, this looks like a great arrangement for us, too, the content consumers. Currently, mobile readers have to click on a link in their news feed then wait more than eight seconds for the article to load in another web page. The stories on Instant Articles render beautifully to our smartphones and load … almost instantly. All good then? Well perhaps not. And here we return to the price of milk question. Supermarkets can sell us cheap milk because of their bulk purchasing power. Dairy farmers have few or no alternative buyers to turn to. Supermarkets can set the price because they own the distribution. The access to a vast customer base. The power is one sided. It’s a take-it-or-leave-it strategy imposed by the buyers. And so here are the parallels between supermarket and Facebook. Growing market share brings with it growing market power. And with this concentration of power Facebook flexes its muscle on the flow of news we get to see in our feeds. We’re all at the mercy of the Mark Zuckerberg’s algorithm. It’s this mathematical formula, not the news outlet, not the advertiser, not us the consumer which controls what we see in our ‘news’ feed. Last year, Facebook tinkered with its newsfeed and downgraded clickbait which, according to the Australian Broadcasting Corporation’s Media Watch, caused traffic at Viral Nova and Upworthy, to drop by between half and two-thirds. Facebook treats the algorithm like Colonel Sanders’ recipe of herbs and spices for his Kentucky Fried chicken. A competitive advantage to be guarded at all costs. Others see greater, global importance stored up in this concentration of power: “The way Facebook sees it is that they’ve got what they consider to be a commercial secret, which is private. Actually, it’s got a far bigger significance than that because it fundamentally affects the news people receive, which means it has significant implications for democracy” Professor George Brock, Professor of Journalism, City University told ABC’s Media Watch. Another fear is that Facebook could idiot-ise, parse out or sanitise our news. If it fails the Zuck-test you might not see it in your newsfeed. For example during the Ferguson riots in the U.S. August 2014, following the shooting of a black teenager, Facebook was almost a riot free zone. I’m not anti Facebook. Far from it. I use it every day to connect with friends and peers around the world. I use FB pages increasingly where recently I would have used LinkedIn groups to further my learning and comment on industry issues. Last month a chance glance at my newsfeed helped re-unite two estranged branches of my family – albeit under sad circumstances. Facebook has become a utility service. My point is to be aware. Alert. Have a backup plan. News outlets need a backup plan to avoid digital sharecropping. They should enjoy the additional audience reach and potential advertising revenue whilst it lasts but also ensure their own mastheads are as enticing as possible in case Facebook changes its algorithm or business strategy again. As news consumers, we should think of Facebook less as a news aggregator and more as news editor choosing what see.